I.: (ordinal) prima. For the period, see Characteristics of Newton’s Latin. duplā: What does this modify? line 2: vis insita: innate force (vs. vis impressa): The phrase was old (Horace, Cicero, Kepler, etc.). but Newton was redefining it. uniform-iter: What part of speech? est: linking verb (not there is; see "Characteristics"). 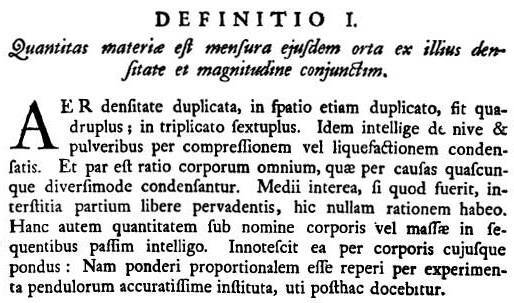 Note: Newton says there are three kinds of quantities of centripital force: absoluta (Definitio VI), acceleratrix (Definitio VII), and motrix (Definitio VIII).